The IWSC International Winemaker of the Year Trophy is an extremely coveted title and to win this not only once but a staggering 3 times is a massive achievement. Abrie Beeslaar was presented with this award for the third time at the International Wine and Spirit Competition (IWSC) gala ceremony in London on 15 November 2017. At Seabourne Express, we are extremely proud & honoured to be the chosen courier for Abrie to move his private label wine collection. Beeslaar Wines have many accolades including the latest on the Tim Atkin 2017 report being “Overall Red Wine of the Year: Beeslaar Pinotage 2015”. Congratulations on your title, Abrie & we wish you many more years of passionate wine making! 18-05-2017Try our Overnight Road Service. Do you want to send your loved ones something special but don't want to pay an arm and a leg to get it to them? 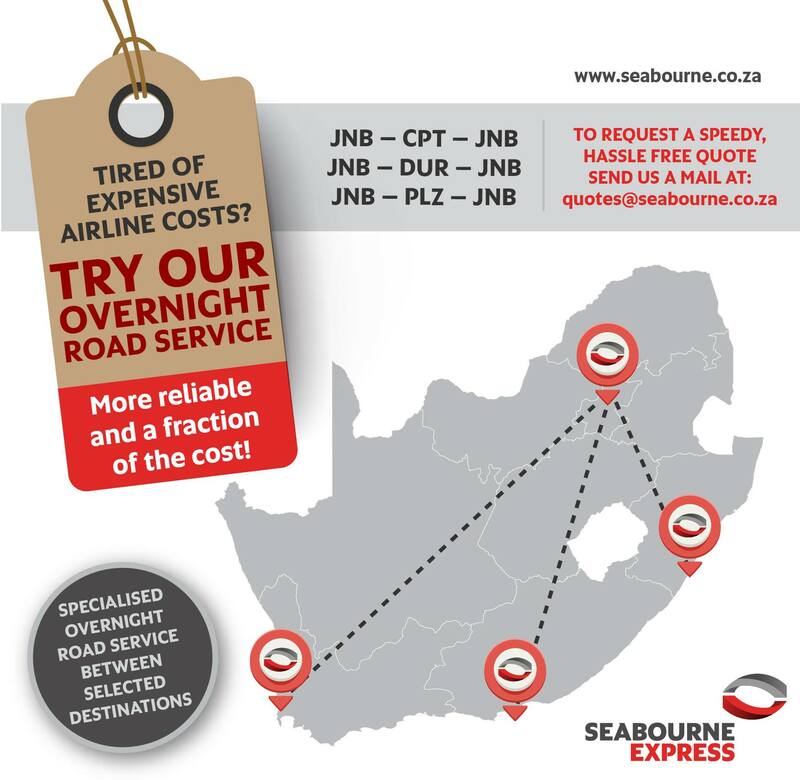 Try our Overnight Road Service. Reliable transport at a fraction of the cost. Excellent Sufficient Service with a smile!! Ezelle Harris, you have a team to be proud off! I dealt with a lot of couriers in the past but in this case I take my hat off!! Mari Schwarts - prompt with reply and feedback - not once did I have to ask about my shipment - I was kept in the loop at all times. Your teams prompt, friendly and excellent!! Special thanks to Imthiaz Noor Mohammed and Gugulethu for collecting my consignment and special thanks to Gladstone and Wiseman for delivering my consignment!! You guys were helpful friendly and man I just can't extend how happy I am with the service I have received!! Mari, keep it up!!! Your friendlyness and helpfulness is an assist to the company!! I would definitely recommend Seabourne Express!! One VERY VERY happy Customer!!!!! Seabourne Express South Africa was given an opportunity to add a complementary business to our existing portfolio. In the process the company has gained more visibility in its core courier and distribution business and gained a warehouse component specifically aimed at the specialist technology market. This has meant upgrades to most of our branches countrywide as the whole company embraced this exciting and important new venture! Most of the planning took place at the end of 2015, the building of infrastructure (shelving, IT backbone, telephony system) was done in early January 2016 and the new site was occupied after 11 years doing business at the previous premises. Our actual handover of stock commenced end of January and continued for 6 weeks. Seabourne South Africa is proud to continue its excellent service to our current clients and look forward to extend the same level of service to our new business partners.